I saw some little jars at The Container Store a few weeks ago and thought they would be great to store touch-up paint in. 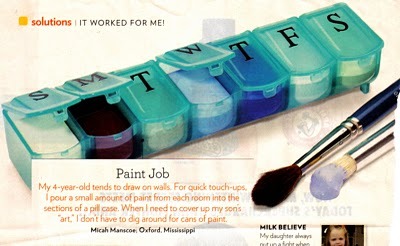 I have been wanting to put some touch-up paint in small containers ever since I saw Lauren's organization project on her blog Pure Style Home last January (2010). You can see Lauren's post here where she presents the idea and her second post here where she shares reader's ideas & photos. Obviously I didn't need to go out and by new jars - any little jar would have worked but I liked that they all matched. I could have used many different ways to label the jars but I just wanted them to be neat and clean and also wanted to use what I had around the house which was cardstock and plastic page protectors. I printed the labels onto the cardstock and taped them on the jars with double-stick tape and then cut up a plastic page protector and put that on top (secured with double-stick tape) to protect the paper from paint and dirt. I can easily change the labels when the paint runs out or I change wall colors. My sister was with me when I found the jars and she thought it would be cute to paint the brushes to match! I found some 30 cent brushes when I was at the paint store last week and thought I 'd play around with painting them. I'm not sure what I am going to do with the brushes but they are kind of cute! While was I getting my paint cans out to put them in the smaller jars, I noticed that some were quite old and others I did not need any longer. I like to label my cans so that I know when I bought the paint. Oops.. time to get rid of this can! Getting rid of paint cans is not the easiest thing - you either have to let it completely dry up (which can take forever) or drive it down to the hazardous waste drop off. So when I found these little packets of paint hardener for a couple of dollars at the paint store I thought I'd give it a try. All you have to do is pour the packet into the paint and stir. Within minutes it is as hard as a rock and ready to throw away. The last image is showing the can upside down! Speaking of paint. It is nice to have samples of all your paint colors together in one place. When I am working with a client, I will present them with their paint swatches labeled on cardstock and covered with a page protector all ready to be put into their household binder. Tip of the day: To patch a nail hole quickly, mix dry patching compound (like Presto Patch) with a bit of wall paint instead of water. 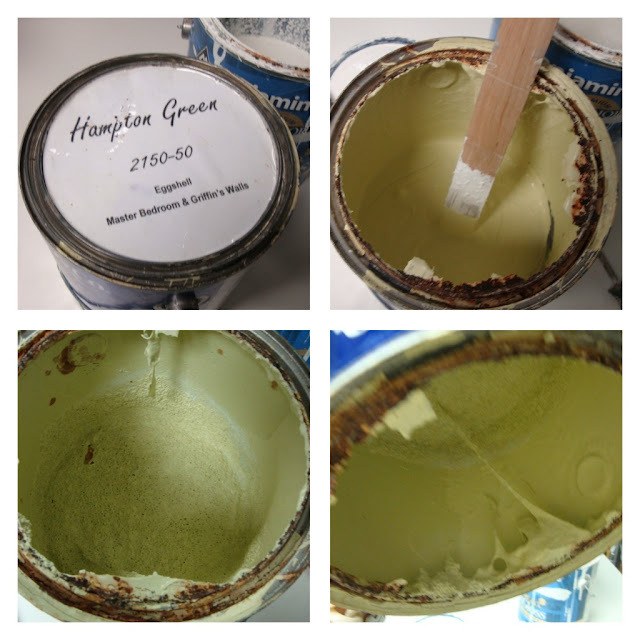 Dab the paint colored patch into the hole and wipe with a putty knife or even a stiff piece of cardboard. Wow! Sherri!!! I am loving your ideas and the great "tip of the day"! I'm selling my house, and after moving I'm sure I'll have to paint the new house. This is great to keep on track of them. Thank you so much for finding that video for me! It was so nice of you and I loved watching it! Post of the Day: A Multi-million House in Malibu. Great ideas! So clearly labeled & organized. LOVE the painted paint brushs! That is really interesting how the paint hardener works. wow, this was the best post! I love those painted brushes!!! You are so creative with your organization. Love it! Sherri, a great post! I also read the post by Lauren and I used old jars to hold the touch up paint for my house. I Love the idea of how you presented the paint colors to a client.